When is a flood a “flood”? When is a flood a flood? In Parker Pad & Printing Ltd. v. Gore Mutual Insurance Company, the plaintiff’s premises in Haliburton, Ontario were flooded during a severe rainfall. The rainfall resulted in large pools of water collecting outside of the north-west wall of the premises. Water entered the building and covered an extensive area of the interior floor. 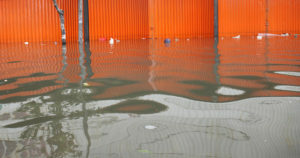 The flood caused damages to the flooring, walls, printed products, and equipment. At the time of the loss, Parker Pad was insured under an All Risks Policy with Gore. The insurer denied the plaintiff’s claim on the basis that the loss did not fall within the scope of coverage. More specifically, Gore denied coverage on the basis that the loss was captured by the “flood” exclusions in the policy. (c)(i) by seepage, leakage or influx of water derived from natural sources through basement walls, doors, windows or other openings therein, foundations, basement floors, sidewalks, sidewalk lights, or by the backing up of sewers, sumps, septic tanks or drains, unless concurrently and directly caused by a peril not otherwise excluded in PERILS EXCLUDED, hereof. Gore denied coverage under the Flood Endorsement, claiming that the loss was not caused by a “flood”. Parker Pad sued Gore for coverage and the broker (presumably for negligence). In a motion for summary judgment, the judge had to determine whether the flood exclusions applied and, if so, whether there was coverage under the Flood Endorsement. The judge found that the flood exclusions in the policy did apply because the loss occurred “by seepage, leakage or influx of water derived from natural sources through … foundations”. Accordingly, the policy did not cover the loss. In my opinion the ordinary meaning of the phrase “the rising of, the breaking out or the overflow of any body of water whether natural or man—made and includes waves, tides, tidal waves, and tsunami” is limited to pre-existing bodies of water and does not include pooling of rain water in a location where no body of water previously existed. I come to this conclusion by considering all of the words in context. A pre-existing body of water such as a lake, river or reservoir can rise, breakout or overflow. In this case the pool of water did not exist before the rain, and cannot be said to rise, break out or overflow because it has no pre-determined boundary or level from which it can rise, break out or overflow. While the term “body of water” might be ambiguous when considered in isolation, it is not ambiguous when considered in the context of the complete clause. In my view the context clearly shows that the intention was to include the rising, breaking out or overflow of an existing and identifiable body of water. Accordingly, the loss was not covered under the Flood Endorsement and the action against the insurer was dismissed. There is no evidence in this case whether the Parker premises was anywhere near a “body of water” such that this Flood Endorsement was the appropriate coverage for that building. It may be that what Parker needed was coverage to override the exclusions in clause 6B(c) of the policy, rather then the Flood Endorsement to cover what was excluded by clause 6B(b). No doubt the broker should be concerned with those statements as the action proceeds against it. Overland Flooding Coverage: An E&O minefield for brokers?